MOANA. (DVD Artwork). ©Walt Disney..
HOLLYWOOD—Walt Disney Animation Studios’ Oscar-nominated “Moana,” the sweeping story of a spirited teenager who sets off on a daring adventure to save her people, sails to home video on Tuesday March 7. 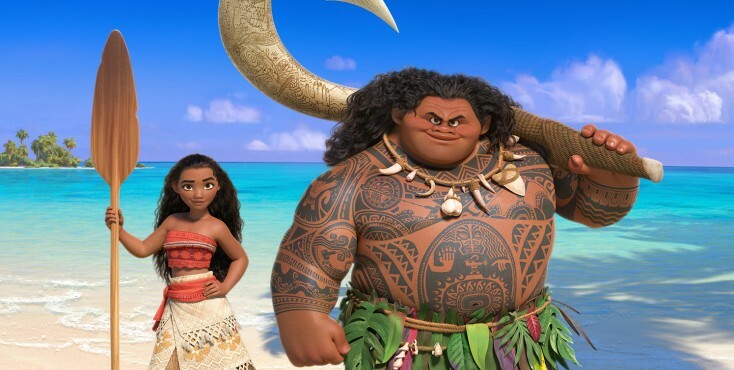 Starring newcomer Auli‘i Cravalho as the voice of brave and tenacious Moana and Dwayne “The Rock” Johnson (HBO’s “Ballers”) as the larger-than-life demigod Maui, the animated Pacific Islands-themed film has become both a critical and box office success since its release last November. 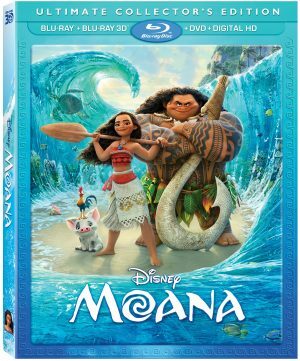 “Moana” will be available on Blu-ray 3D, Blu-ray, DVD and On-Demand and already is available on Digital HD/3D and Disney Movies Anywhere (DMA). Continuing the fun-filled adventure, viewers are treated to hours of extensive and entertaining bonus offerings including a new, hilarious mini-movie featuring Moana and Maui; an in-depth look at how the people, cultures and heritage of the Pacific Islands shaped the story of “Moana;” a Q&A with co-stars Auli‘i Cravalho and Dwayne Johnson, and famed animation directors Ron Clements and John Musker (“The Little Mermaid,” “Aladdin,” “Hercules”) who reveal their favorite foods, how many hours a night they sleep, phobias, their favorite Disney songs, what they would shape-shift into and more; insider access to Lin-Manuel Miranda, Mark Mancina and Opetaia Foaʻi, the trio behind the film’s uplifting music; four mini-documentaries highlighting the movie’s groundbreaking effects; deleted scenes; a deleted song; hidden Easter Eggs; a music video; “Inner Workings,” a theatrical short animated film directed by Leo Matsuda that spotlights the internal struggle between a man’s brain and heart; and more. In addition to Cravalho and Johnson, “Moana’s” voice cast includes Temuera Morrison (“Star Wars: Episode II – Attack of the Clones”) as Moana’s no-nonsense father, Chief Tui; Rachel House (“Whale Rider”) as Moana’s trusted Gramma Tala; and Grammy nominated singer Nicole Scherzinger as Moana’s playful and strong-willed mother, Sina; Jemaine Clement (“Flight of the Conchords”) as Tamatoa, a self-absorbed, 50-foot crab; and Alan Tudyk (“Zootopia”) as the scene-stealing stowaway rooster Heihei. “Moana” was inspired by the great explorers who masterfully navigated the vast Pacific, discovering the many islands of Oceania. Moana’s quest to become a wayfinder also serves as a journey of self-discovery, empowering her to find her own identity. During a recent presentation held at Disney’s historic Animation Studios headquarters, producer Osnat Shurer and Ron Clements, one of the co-directors of the animated feature, spoke about the home entertainment release and their excitement surrounding being nominated for two Oscars (Best Song and Best Animated Feature). (Musker was unavailable.) Among other surprises, they revealed that the initial story was going to center on Johnson’s character, Maui, but in their research they shifted the focus to a teenage girl finding her way. Maui initially was designed to be bald, but over the course of the production, ended up with long, curly hair, one of the challenging technical feats achieved by Disney animators. Shurer, a former Pixar executive who worked on several of that sister studio’s short films, added that the filmmakers created an Oceanic Story Trust comprised of an elite group of experts on the Pacific Islands, who advised them on the history and culture. A 30-minute documentary called “Voice of the Islands,” on that group’s input into the “Moana” story is included on the various home entertainment editions. Shurer added that music was essential to the film, not only because it is so prevalent on the islands but also because Clements and Musker have successfully combined character-driven stories with music in their previous Disney animated features. One of the bonus features shows Lin-Manuel Miranda, Mark Mancina and Opetaia Foaʻi in a studio shaping the songs for “Moana.” Miranda was still relatively unknown when the filmmakers approached him about writing music for the film. “Hamilton,” which became a hit Broadway show, was still in rehearsals. He would communicate via Skype with the filmmakers about his progress on the “Moana” songs during breaks between performances. “We Know the Way,” which he wrote with Opetaia Foa’i and Mark Mancina, was the first song created for the movie. “Because of that, all our demo songs—usually it’s just the person singing into a mic of a cassette recorder—were all ‘Hamilton’ cast members,” Shurer said, with a laugh. Shurer explained that some of the biggest challenges in making the animated film was creating the water. Previous PostPhotos: ‘100 Streets,’ ‘Eyes of My Mother,’ ‘Suspects,’ ‘Wentworth,’ More on Home Entertainment … plus giveaways!! !